It’s our wedding menu! Over the next few weeks I’ll be sharing homemade versions of some of our reception eats, our cake, and our wedding favors. You can see the recipe for one of our cocktail hour appetizers here! As much as I care about food, choosing our wedding caterer was kind of a black box for us. 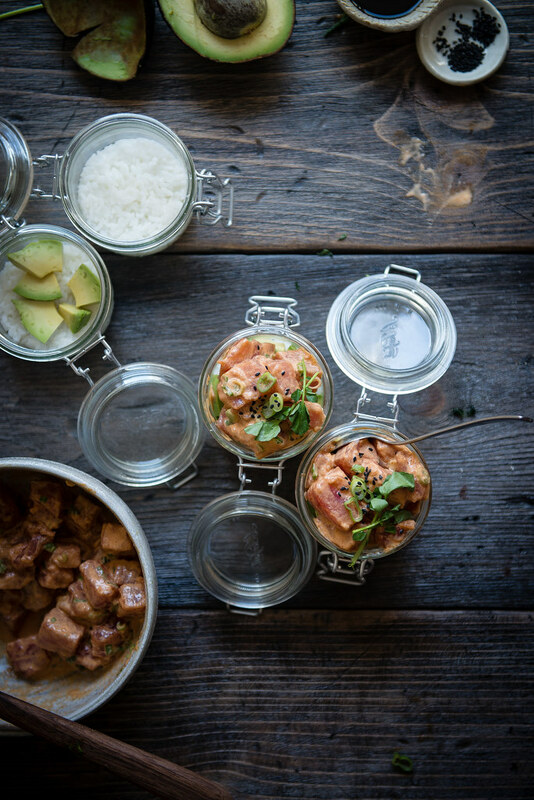 We wanted the food to be, you know, good, but other than that, all we really knew was that we really, really wanted poke. 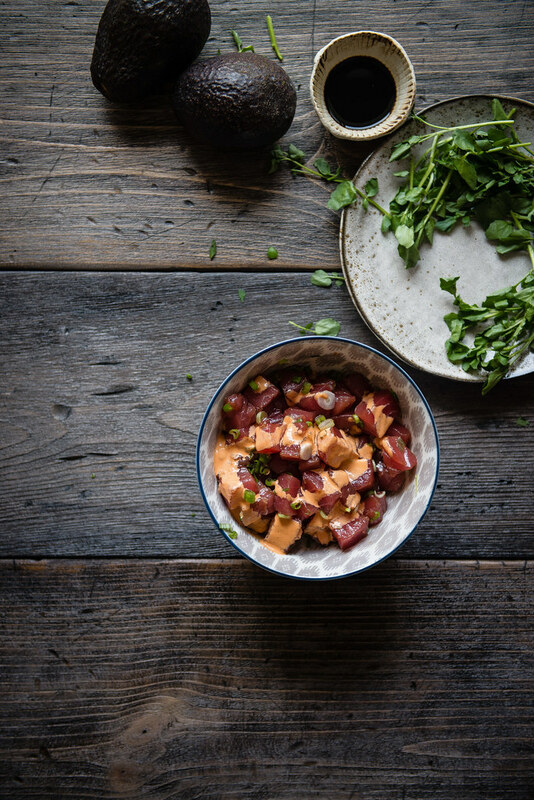 Spicy ahi poke (preferably from Foodland) is one of B2’s favorite foods, and even though we figured we’d be going with the standard beef-or-fish-or-vegetarian choices for our entrees, we were really hoping it could make an appearance elsewhere. I’d be lying if I said we didn’t briefly consider asking whoever would be the ones making our food to please just buy out an entire Foodland stash and serve it up as our second course, plating optional. Luckily, the caterer we did go with had something even better in store. 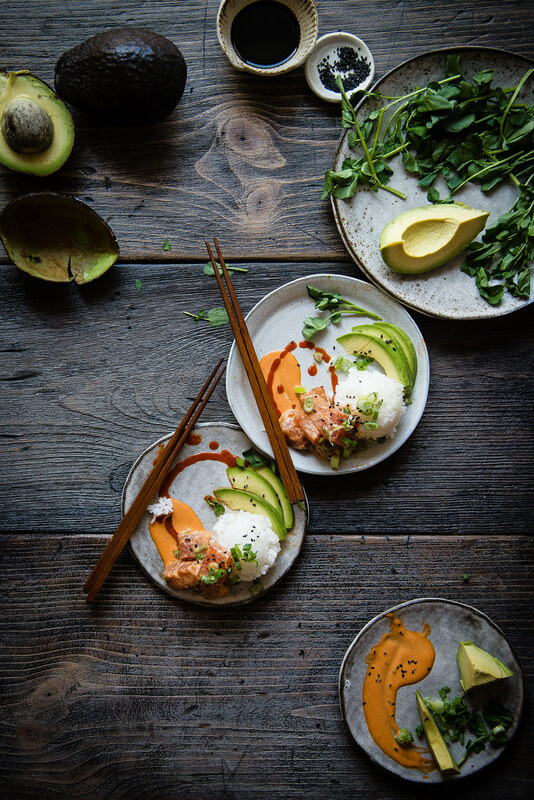 They call it a “parfaitini” — layers of sushi rice, creamy avocado, and fresh, spicy poke, topped with kaiware sprouts and a happy confetti of tobiko. It’s served up in a martini glass (which I’m guessing is where the name comes from) and it is genius, perfect, and utterly delicious. 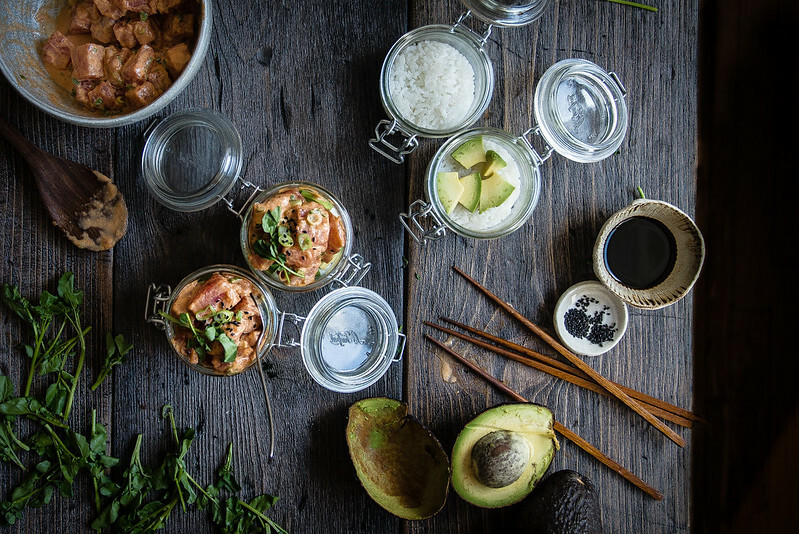 Whenever B2 and I have poke it’s a simple affair, straight out of the plastic containers at Foodland or out of a styrofoam clamshell at a hole-in-the-wall, just poke and rice and wooden chopsticks. 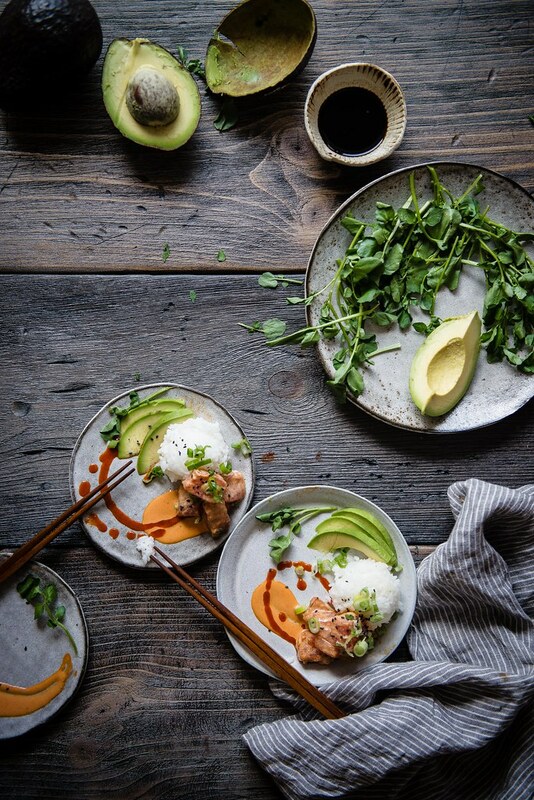 But adding buttery avocado ups the decadence just the perfect amount to make his favorite food feel celebratory, and layering it all into a glass James Bond-style makes for a satisfyingly balanced (and classy) bite every time. I loved it so much that after we tried it I asked them if they had any extra big martini glasses so we could have more of it for each guest. (I know, I’m nothing if not a glutton.) This might be one of the things we’re most looking forward to about our reception dinner, and I’m so glad that one of B2’s favorite things is showing up on what will be one of our favorite days. Yield: serves 2-3 as a meal or 4-6 as an appetizer. 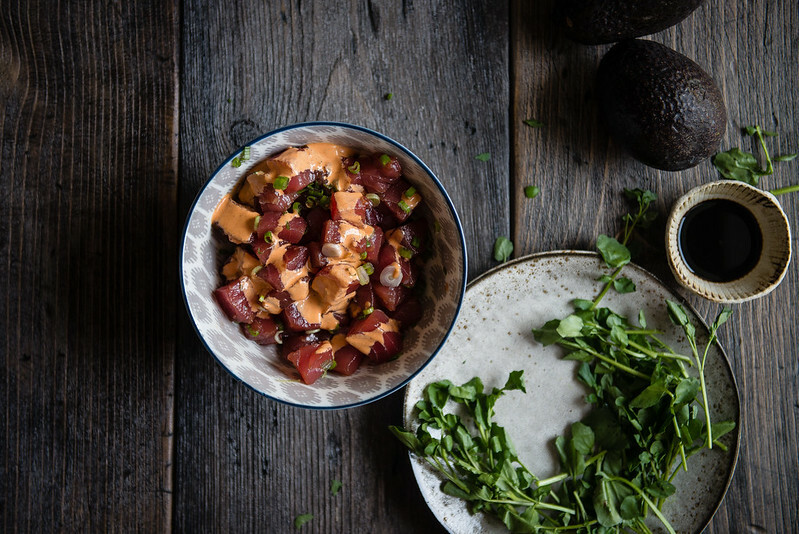 This uses a barely tweaked version of the spicy ahi poke I posted way back when in the blog's early days (incidentally, almost two years ago to the day!) I found that kewpie mayo really adds an extra depth of flavor that matches the poke we love more than regular mayonnaise does, but if you can't find it, either version is delicious. If tuna is frozen, thaw by submerging in cold water for 30 minutes. When tuna is just short of fully thawed, slice into small cubes, around 3/4 inch or smaller. I tend to go a bit smaller for more flavor. Combine in a bowl with about 1 tbsp soy sauce, about 1/2 tbsp sesame oil, and 1 chopped scallion. Feel free to adjust the soy sauce and sesame oil to your taste -- I generally use just enough to coat the tuna thinly. Chill in fridge for about 30 minutes. 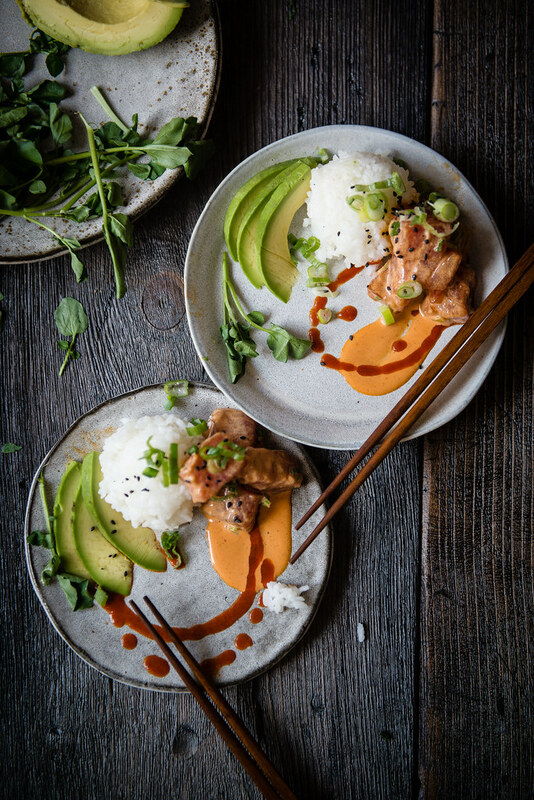 Combine the kewpie mayonnaise, Sriracha, remaining scallions, and 1 tbsp tobiko or masago, whisking briefly until combined. When tuna is chilled, add the spicy mayonnaise mixture and mix gently until fully coated. 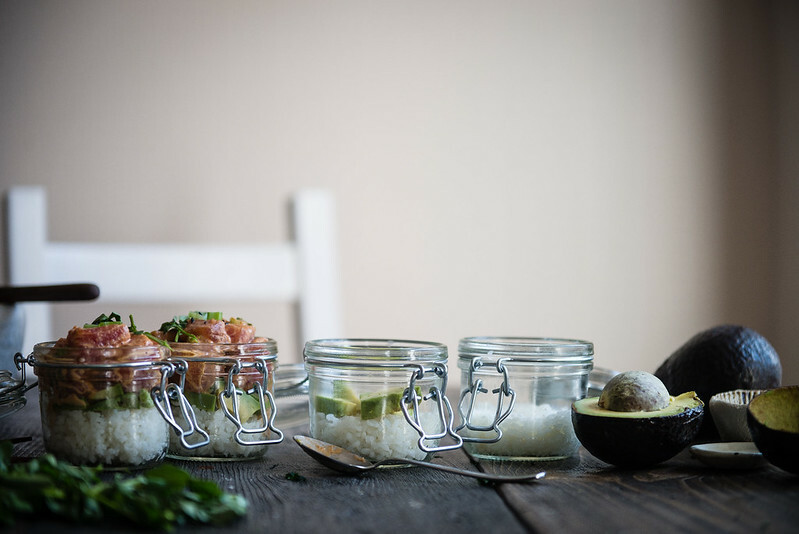 Layer rice, avocado, and poke in small bowls, glasses, or Weck jars, then top with microgreens of your choice, sesame seeds, scallions, and tobiko. Serve immediately. 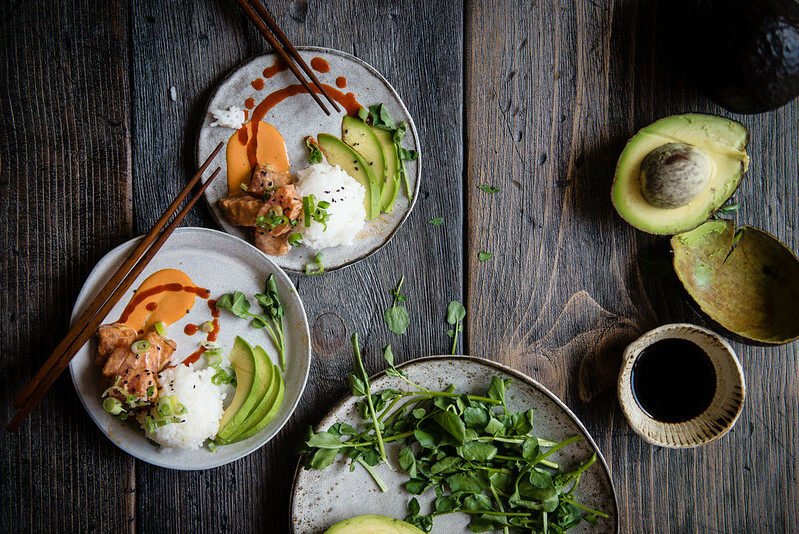 I didn't spring for the tobiko for this version, but it adds a salty finish that is incomparable if you feel like treating yourself to a little jar. Similarly, I couldn't track down kaiware (daikon) sprouts or microgreens for the dish, but watercress will work just as well. If I could be so lucky to see all this wonderful food at your wedding! 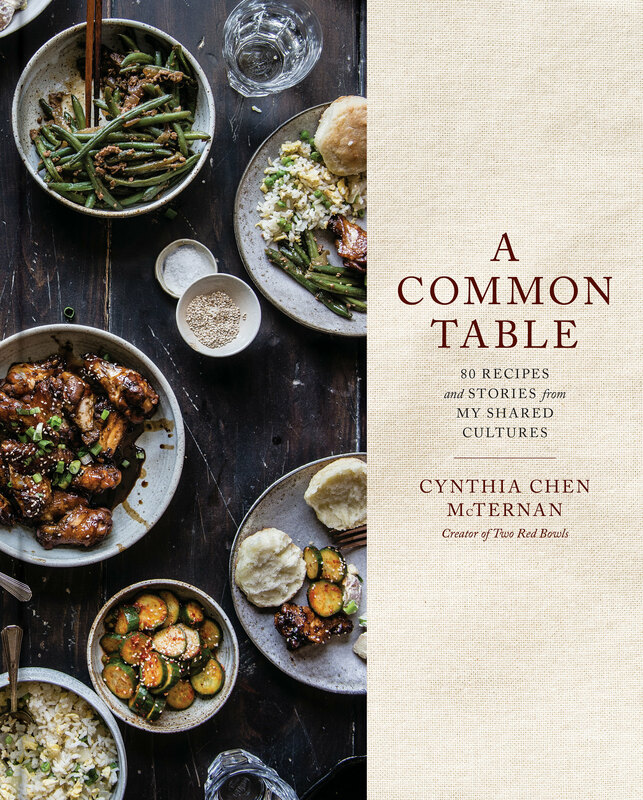 It will be the banquet of a life time with such diverse cuisine. 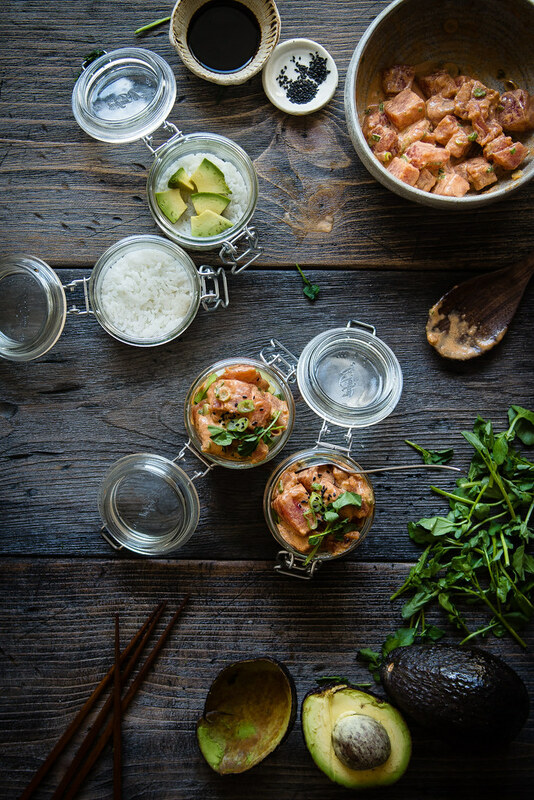 Love the mix of creamy spiky poke and avo; also served in a jar! So cute! Parfaitini may be my new favourite ever word. Everything tastes better when eaten out of a cocktail glass in my opinion. So love that you’re sharing all of these wedding eats with us! I totally agree!!!! And baha I’m so glad to hear that you’re not getting tired of all the wedding talk 😉 I cannot wait for yours in October! Wow it looks so yummy! Love all the photography. I liked the way it’s served in the little jars. I really like how you’ll be serving it at your wedding. It’s not typical wedding food, but I think that it’ll impress all the guests! I hope they love it as much as we do! 🙂 Thank you so much, Rachel! I love that you guys asked for extra large martini glasses. You are the best. Really. That IS a genius idea!! Your guests are in for a treat – this looks stunning! 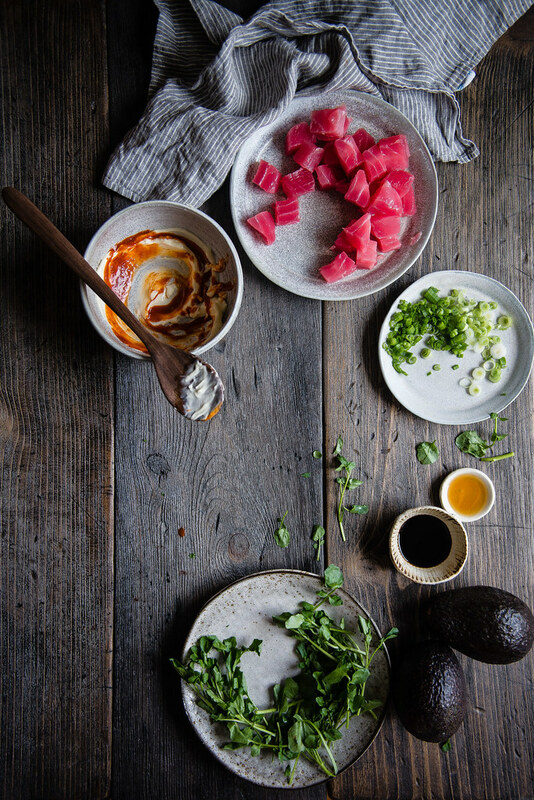 Everything about this looks insanely delicious! I love ahi tuna towers at sushi restaurants, and I have a feeling I’m going to love this! Beautiful styling and colors, by the way! This looks absurdly delicious! Your photography is amazing, too! I wish I could just reach into the screen for a jar of that deliciousness! yeah this is my JAM. that sauce! sounds so delicious. gorgeous shots too, girl! snaps. I could eat this everyday! Those little jars.. Oh this is just amazing. also, i am so excited for your wedding!! the insta the other day of all your seating chart cards and etc and it was so, so beautiful. Cynthia! These are absolutely exquisite—the styling on those plated shots is just HOLY WOW. And they sound so, SO delish! 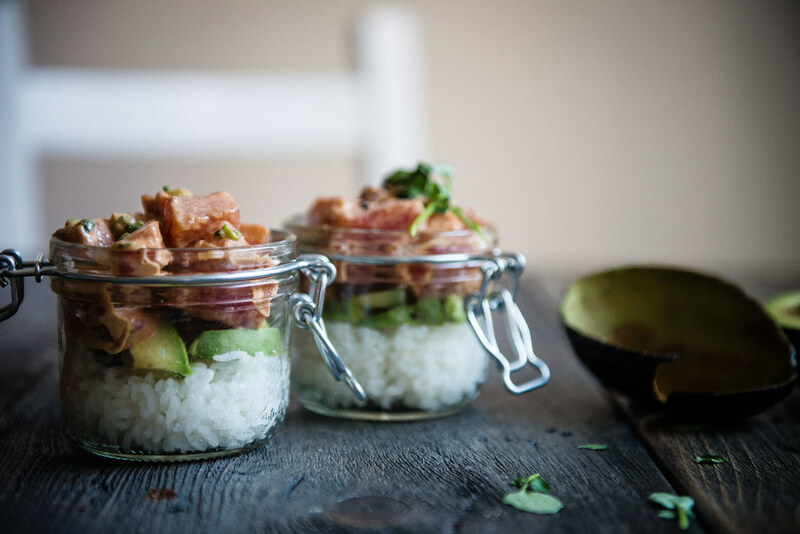 I’m actually going out for poke bowls tonight, but must try making these at home asap. Sidebar, along the lines of seeking kaiware sprouts: I’ve been making rice bowls for lunch and topping them with pea shoots! Could be a good replacement, if none of the others are around. look at you making up cute words! love this and deffo want to eat seven of them. 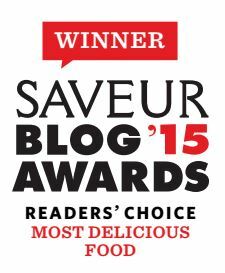 btw, congrats on the saveur win! so so so deserved. You are absolutely a professional cook! These photos are very simple but stunning. How can you do it? Your wedding reception is going to be perfect, you will definitely wow your guests!!! I don’t know if I should give you more congratulations on the wedding or on scoring parfaitinis or on this photography or the recipe or what. Let’s call it a tie!? Also, I’m totally down for anything served out of a martini glass. I went to this wedding once where like EVERYTHING was served out of a martini glass (there was a mashed potato-tini bar & some kind of chocolate fountain thing that you could literally just drink out of a martini glass & also some kind of martini sorbet thingy). It was incredible. Woohoo for parfaitinis! Woohoo for you and B2! Cynthia, I love poke! It is probably one of my favorite dishes to eat once a month. I’m going to try your version at home. Hope the wedding is coming along fabulously!